To build, support, and maintain a high-quality long-term care residence on North Haven, so that our seniors—after they can no longer stay in their homes—can remain in our community, surrounded by caretakers and visitors they know and love. We seek to create a residence that is home-like, integrated into the community, sustainable to maintain and operate, and that will take advantage of its beautiful location on Southern Harbor. The facility will also provide respite care and hospice services in the residence when possible and provide assistance to seniors at home. Buy a brick to support the eldercare facility. In March of 2014, just as the cold stretched well beyond its welcome, the generosity and vision of one summer resident helped shake the island from the late winter doldrums. Mary White offered to donate her historic “yellow house” (the former Rice family home or Peleg Thomas Farm) for the purposes of creating an eldercare facility and a publicly accessible conservation area. The project is a joint partnership of North Haven Sustainable Housing (NHSH), North Haven Conservation Partners (NHCP), and Southern Harbor Eldercare Services (SHES), a newly formed organization whose primary objective is to develop an island long-term care facility. 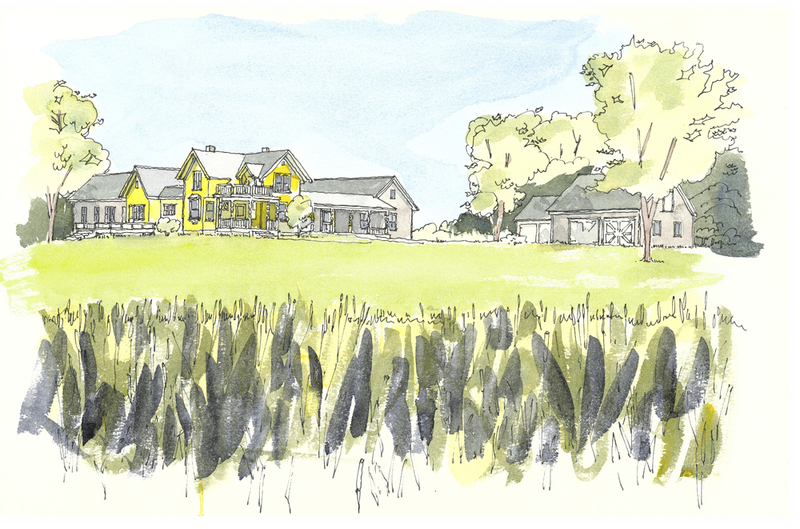 For the past year, North Haven architect and summer resident John Tittmann and his firm has worked with our NHSH/SHES design committee on a renovation and expansion plan for the “yellow house”. 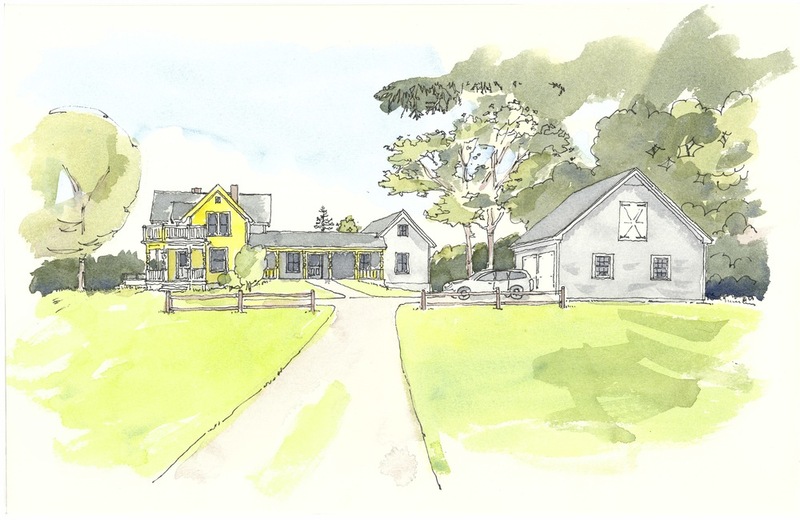 The goals for the design included incorporating the current yellow house and its assets, building a highly efficient expansion that would be affordable to build, heat and maintain, designing an expansion that visually consistent with island architecture, and a plan that would allow residents and visitors to enjoy this beautiful piece of property. Creating a space that would be home-like and inviting for residents—with shared community spaces and opportunities for privacy is also key. Three other year-round island communities have small, state-licensed assisted living facilities: the Ivan Calderwood Homestead on Vinalhaven, the Boardman Cottage on Islesboro, and the Island Commons on Chebeague. Some facilities, like Islesboro’s Boardman Cottage, also provide in-home support, day programs, hospice, and respite care to year-round and summer residents. A sustainable business plan is essential, and learning from the experiences of the three other offshore island facilities and experts in the development and operation of small long-term care facilities has been extremely important. The pitfalls, challenges, improvements, and financials of the other facilities have already proven essential to launching a sustainable and well-planned concept. We have spent a great deal of time thinking about what type of facility will sustainably serve the needs of North Haven. Our thinking was informed by conversations with State Licensing staff, national experts, and administrators and staff members of other small rural care facilities. In those conversations we talked about models that allow for quality care, stable funding streams, and allow residents to remain active in the North Haven community. This facility will be licensed as a six-bed adult family care home, a State of Maine term for a small community long-term care facility. These long-term care residences provide care and assistance to community members who can no longer stay in their homes because they need help with some or many activities of daily living (meals, bathing, mobility transfers, etc.) SHES anticipates opening its doors with staffing for a couple of residents and increasing capacity and staff as the use of the facility grows. We have learned from the other islands and other rural communities that adult family care homes can meet most seniors’ needs through the end of life, including hospice care. There are some individuals with greater medical needs (like those with severe memory disorders) whose needs can’t be met in this type of facility because they need the level of skilled nursing that only a specialized nursing home provides. This island project won’t guarantee that all long-term care residential needs can be met on island, yet it will be viable option for the majority who need this care and want to stay on the island. SHES plans to operate a caring, community-integrated long-term care facility where staff will be largely from the island, community members will be engaged regularly as visitors and volunteers, and residents will enjoy respect and the highest quality of life possible in their final years. The facility will be licensed by the State such that eligible residents will receive MaineCare (Medicaid) support. Our goal is to create a facility that is sustainable over time. The challenge for small, long-term care facilities serving entire communities is that many of residents will be paid for by MaineCare (Medicaid) and the current reimbursement rates cover approximately 50% of what it costs to maintain a quality program for a resident. We assume that the mix of residents will vary, but the projected budget scenario assumes that four of the six beds are paid for by MaineCare, as we felt it was best to plan for the most challenging budget conditions, and begin now to make sure we could care for all community members, regardless of their ability to pay. One important goal of this campaign is to launch North Haven’s eldercare facility on the best possible financial footing, assuring its success for the future, and reducing the scope of the future annual fundraising to a limited amount. To request a detailed informational booklet on the project, either click here to view the PDF, or use our Contact Page and write "Booklet" in the subject heading while including your mailing address in the message box. And read through our Frequently Asked Questions document for more information. We welcome your ideas and support!